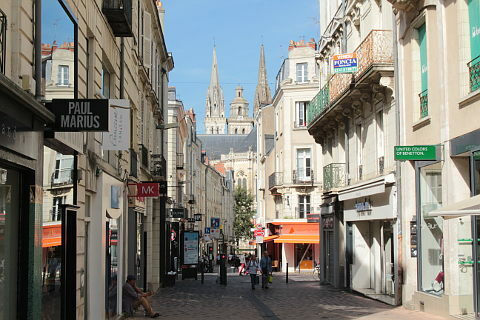 The highlight of a visit is surely the Chateau d'Angers and the Apocalypse Tapestry but Angers is a very attractive city and there are several other highlights to enjoy during your visit. 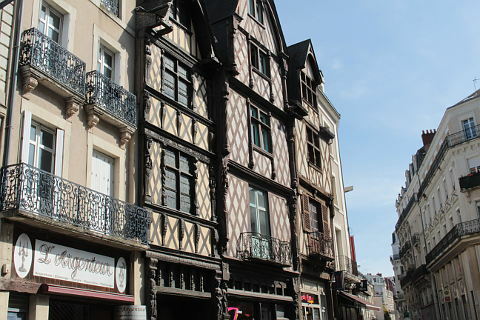 Angers is sometimes referred to as the ‘Black’ because of the slate with which its buildings are constructed. It is a city which still retains its medieval structure, with narrow, winding streets and is a tourist town of considerable attractions. 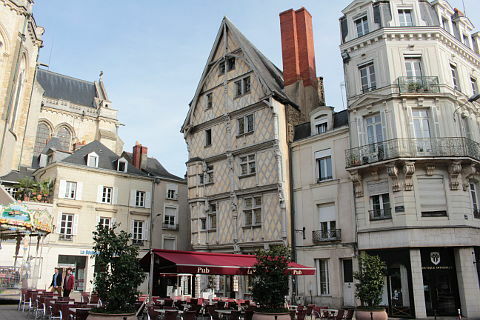 Of course the castle which is in the centre of Angers dominates the town and is well worth a visit. It is also rather striking with its many columns with striped patterns and also for the atrractive parterre gardens laid out around its base. 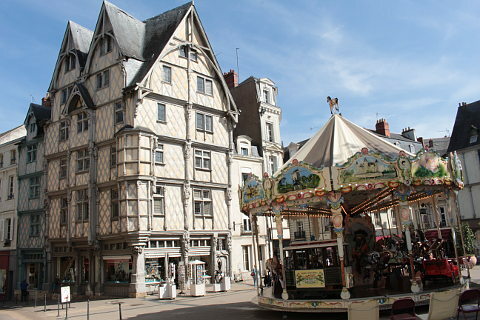 However Angers is a vibrant and interesting town with more to see than just the castle. 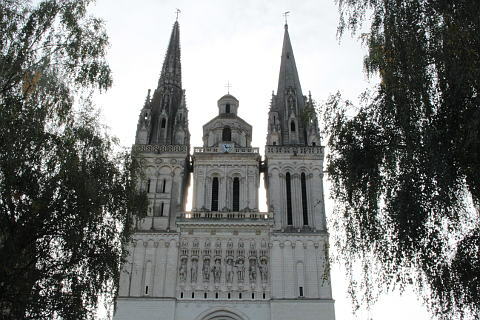 Next to the castle stands the Cathedral of Saint-Maurice, consecrated in 1030 by Bishop Hubert, and then extended over the centuries. In gothic style it is a Latin cross and a single nave, with sail vaults and a series of beautiful stained glass windows and numerous statues. 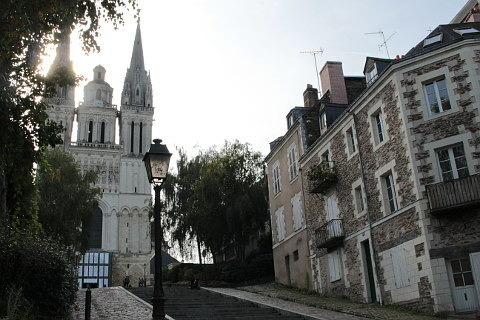 On one side is a flight of steps leading up to the narrow double spired rear of the cathedral, rather a striking view. At the other end is the Place Sante-Croix which is at the vibrant heart of the town. Here you can see the medieval ‘House of Adam’ (‘Maison d'Adam’), which is decorated with a series of sculptures including the tree of life and perhaps most famous 'Le Tricouillard' who has his trousers down and everything hanging out! 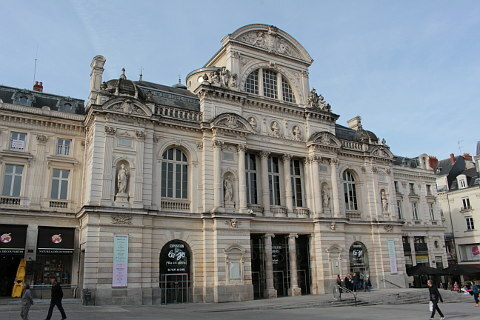 Not far from here is the beautiful Grand Theatre and the Collegiale Saint Martin. 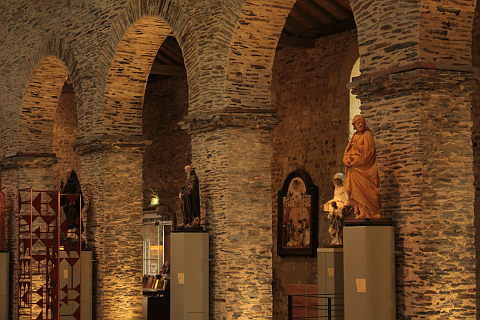 The Collegiale Saint Martin is one of the best preserved medieval Renaissance buildings in France and you can enter its lovely interior for a small fee and admire both its architecture and the year round art exhibitions that are on display. Look out both for the crypt with its sarcophages and in another basement area the mould which was used to create the church bells - too big to be easily transported and so created in situ. 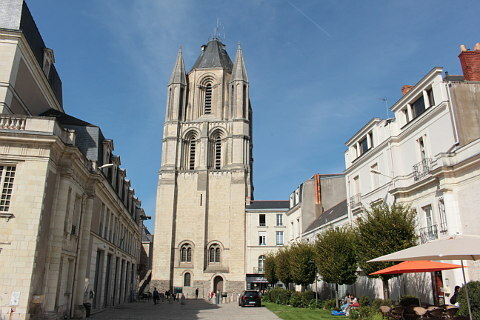 Another religious building that is now used to house exhibits is the tour Saint-Aubin which is 54 meters high and was built in the 12th century. 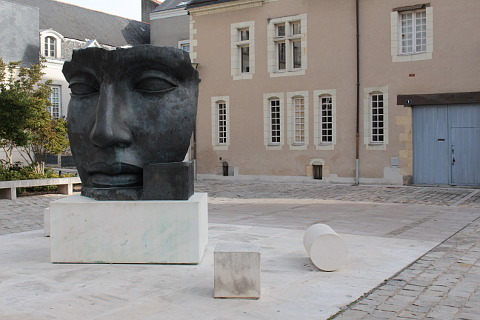 Close by the Musée des Beaux Artes and the Galerie David d'Angers in neighbouring buildings are not only beautiful but are home to some fine art works. The Musée des Beaux Arts in Rue du Musée has paintings from the fourteenth to the twentieth century, with works like ‘The Virgin and Child and St. John the Baptist’, by Botticino (1446-1497), ‘The Virgin and Child’, by Niccolò Pisano (1470 ca.-1536), ‘Les Festin de Diex’ by Jan Brueghel the Elder (1568-1625), Rubens [1577-1640] ( ‘Silène’), Lorenzo Lippi [1606-1665] (‘Allegory of the simulation’), as well as many landscapes (Monet [1840-1926], Lebourg [1849-1928], Boudin [1824-1898], Lebasque[1865-1937]). 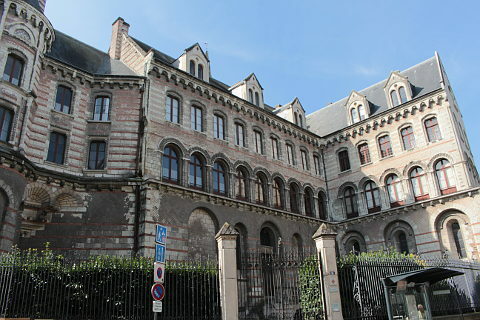 The Museum is housed in a 15th century mansion and has a garden too - the Jardin du Musée des Beaux Arts et le cloitre Toussaint. 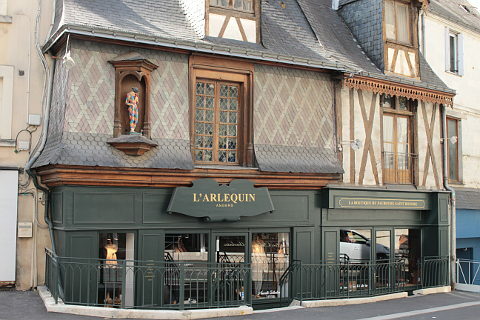 The David of Angers Gallery is dedicated to David d'Angers (1788-1856), one of the most famous sculptors of France and creator of busts and sculptures that adorn the main historical monuments of France. The gallery is very distinctive in that it is housed in a 13th century abbey church that has been restored and now has a glass roof. Another museum in Angers is the ‘Musée Jean Lurçat’, which houses beautiful tapestries by Jean Lurçat (1892-1966); one famous tapestry is called ‘Le chant du monde’, depicting the dangers of our time, such as nuclear disaster. It is interesting to view this having seen the ancient Apocalypse tapestry in the castle. 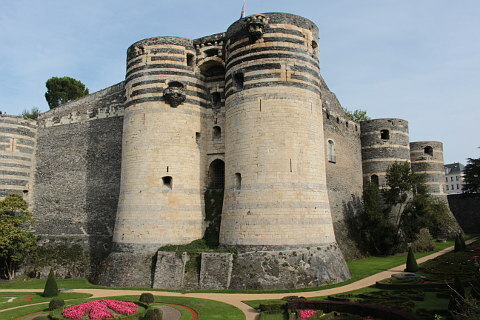 The city of Angers has very ancient origins and it seems possible that it existed in Roman times – the place referred to by Caesar's Commentaries as the place called ‘Andes’ or ‘Andibus’ that was used as a winter camp for his legions. (Lucan (39-65 AD) refers to the place as ‘Andus’). The city was founded on two hills, between which flows the Maine River, which divide it into two parts, connected by several bridges. Angers is an ancient and powerful city, with walls accessible through many gates built over the centuries. The centre of the walled city (the Citadel) is dominated by the castle, which, according to a tradition (not universally accepted), was built in 718 AD by Ranfray, Count of Anjou, who, the chronicles say, built a palatial residence ‘having demolished the monastery of Saint Maur’. This is the legend.The established history of the castle and town dates back to the 13th century. The origin of the name Angers is also unclear, although it is known that the original Roman names of 'Andes’ and ‘Andegaves’ derived from the Gauls who inhabited the area, and Caesar called it ‘Andecavi’. According to one interpretation, the term would mean ‘the great heroes’ or ‘giants’, but this is uncertain. On the other side of the river the Terra Botanica is a huge themed plant and nature park with 11 hectares of gardens. For children the Aquavita aquatic park has indoor and outdoor pools, water slides and a lazy river. 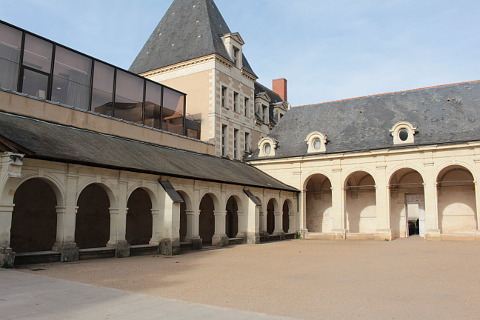 Leaving the city, you can visit the ‘Chateau de Serrand’ a few kilometres from Angers. To immerse yourself in natural beauty, you can hike along the sandy shores of the Maine. Be sure to also try a local wine of Anjou, such as ‘les Coteaux de l'Aubance’ and the ‘Coteaux de Savènniere,’ and ending with the classic liqueur ‘Cointreau’. 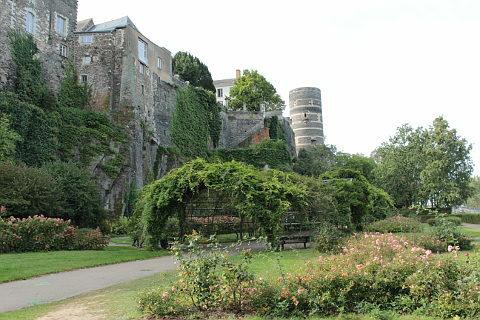 Having visited Angers castle with its fabulous Apocalypse tapestry you may wish to visit some more castles. 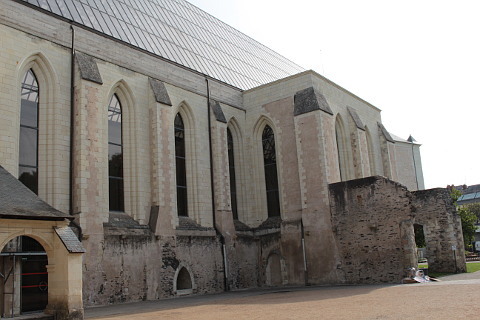 Angers is not far away from the fabulous castles of the Loire Valley. Our favourites included the Chateau d'Amboise, the Chateau de Chambord and the Chateau de Cheverny. The Chateau d'Angers has a striking appearance, sumptuous interiors and the fabulous Apocalypse tapestry.